Poor Georgie soon came to regret eating a packet of yoghurt covered raisins. Grapes, raisins, currants and sultanas can cause renal failure in dogs and cats. Thankfully her owner rang the clinic as soon as this was discovered. Vomiting was induced, charcoal administered and Georgie was kept on intravenous fluids for 48 hours to offset the potential harm the raisins might have caused. We are delighted to say that Georgie is fit and well, and has not suffered any ill effects.This incident acts as a salient reminder that there are many things at home and in the garden that may seem harmless to you and I but can be toxic to our pets. Did you know that lilies can cause renal failure in cats? And don’t forget that certain garden products such as slug bait can be fatal on ingestion. 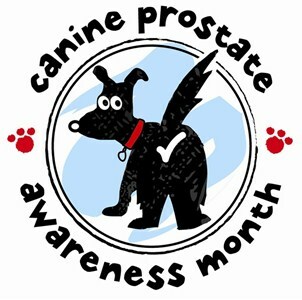 Canine Prostate Awareness Month (CPAM) is an initiative to highlight the prevalence of Benign Prostatic Hyperplasia (BPH) in male dogs, and to encourage owners to check for and seek treatment for it. CPAM takes place during November – or ‘Movember’ as it has been called by those fundraising for human male prostate disease and testicular cancer. More than 80% of entire male dogs over the age of five suffer from BPH, a painful condition which is often hidden. CPAM aims to remind us that men are not the only ones to suffer from prostate disorders. 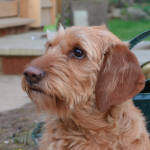 It’s a well-supported initiative and, running it at a time when the media spotlight is already on the dangers of prostate cancer in men, means we can spread the message that owners should also be monitoring dogs for signs of prostate disease. The problem with BPH is that the majority of dogs suffer in silence. It is a painful condition that too often goes unnoticed until it reaches an advanced stage, where the owner notices blood in the urine or painful urination. - Stiff hind limb movement. If you are concerned at all about your dog showing any of the above signs please contact the surgery to make an appointment. Diagnosis and monitoring of BPH is carried out via blood tests and rectal palpation. Simple medical treatment can be administered, the effects of which can be seen within a week and last for six months.